Nelson Vergel (NV): Dr. Michael Scally is a well-known expert on men’s health in general, and specifically he’s an expert on hormone therapy and issues surrounding testosterone replacement. Dr. Scally, can you tell us a little bit about your background? Michael Scally (MS): My education includes a double degree major in chemistry (1975) and life sciences (1975) from the Massachusetts Institute of Technology (MIT) Cambridge, MA. From 1975 to 1980, in the MIT division of Brain Sciences & Neuroendocrinology, I researched and published investigations on neurotransmitter relationships. During this time, I entered the prestigious Health Sciences & Technology Program, a collaboration of the MIT and Harvard Medical School. In 1980, I was awarded by Harvard Medical School a Doctorate of Medicine, MD. In 1983, I completed a fellowship in anesthesiology at Parkland Southwest Memorial, in Dallas. From 1983 to 1994, I was a private practice anesthesiologist. In 1984, I set up the first ambulatory, outpatient, surgery center at Houston. In 1994, I became interested in general and preventative medicine with a focus on endocrinology. I have been active in this area since that time. In 1995, I inquired to Wyeth Pharmaceuticals about the association between primary pulmonary hypertension and pondimin (fenfluramine). I came to learn, this inquiry later was used as evidence in the class-action suit against Wyeth and was instrumental in showing that the known adverse effects were known to Wyeth but not revealed to the public. During 1994, I competed in the Mr. Texas Bodybuilding Championship, placing second. While exercising, I was approached by a number of weightlifters on the medical treatment to restore the hypothalamic-pituitary axis (HPTA) after stopping anabolic steroids (AAS). Many of these same individuals also used over-the-counter (OTC) supplements. As you might know, many bodybuilders are trying to decrease their body fat and increase their muscle mass as much as they can. And with these two specific goals in their mind, they were having a hard time because they were taking this over-the-counter supplement. Within a short time later, I discovered an over-the-counter weight loss supplement containing an ingredient, tiratricol, toxic to the thyroid. The reporting of this to the federal agency, MedWatch, was instrumental in the nationwide seizure of the supplement thus avoiding a disaster to the public health and welfare. We published our findings in the peer- reviewed literature, being the first to do so. This spurred on my interest in the field of men’s health, particularly in the field of testosterone and anabolic steroids. I recognized the use of a treatment for stopping anabolic steroids, both prescription and nonprescription, was without any scientific support. The accepted standard of care within the medical community for anabolic steroid- induced hypogonadism is to do nothing with the expectation the individual will return to normal unassisted. This is proving not to be the case and now jeopardizes the health and welfare of countless individuals. NV: There are lots of misconceptions when it comes to testosterone replacement in men. 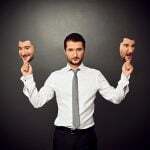 Will you tell us, in your opinion, what are the main misconceptions? For instance, some doctors may think that giving testosterone to somebody with low testosterone may affect the liver, or may cause cancer of the liver or prostate. MS: There are many misconceptions regarding anabolic steroids, which include testosterone. You mentioned two of the areas: liver and prostate cancer. Other areas are enlargement of the prostate or benign prostate hypertrophy, anabolic steroid dependency, cardiovascular disease, and addiction. I believe that many of the misconceptions come about by the politicization of anabolic steroids. As far as prescribed medicines are concerned, anabolic steroids are the only group of drugs with a law specifically aimed at their use. This has led to a lack or absence of good research. Instead, what the medical community has relied on are anecdotal and inflammatory reports. This is probably most evident in the medical community’s steadfast refusal to accept that anabolic steroids increase muscle mass and strength. We now know that anabolic steroids conclusively do increase muscle mass and strength and athletic performance. As far as liver effects, use of the oral anabolic steroids has been reported to cause liver dysfunction and cancer. These reports are primarily in individuals with a preexisting condition treated for extended periods. The intramuscular injections and transdermal preparations do not appear to be associated with liver problems, and routine monitoring is therefore unnecessary. In the thousands of patients I have treated with testosterone, I never even think about liver problems being a contraindication, because they just do not come up. In non-obstructive benign prostatic hyperplasia (BPH), testosterone replacement therapy is not a concern. The prostate volumes increase in an inconsistent manner. As with any treatment, careful monitoring will alert one to a problem. As far as prostatic cancer, there is no association. In 2004, a New England Journal of Medicine article review of over 60 studies on testosterone replacement therapy concluded that there is no causal or association with prostate cancer. NV: But testosterone replacement seems to be getting more and more mainstream. Ever since the introduction of gels like Androgel and Testim, more and more doctors feel comfortable prescribing testosterone. But yet, there are still a lot of fears, too. Another fear is changes in lipids and cardiovascular risks associated with testosterone. Can you expand on that a little? MS: The available data indicate that testosterone replacement therapy within the physiologic range by transdermal or injectable testosterone preparation is not associated with worsening of the lipid profile. Studies using physiologic replacement doses of testosterone show no change, or only a slight decrease, in HDL, often with a reduction in total cholesterol. The oral non-aromatizable anabolic steroids appear to lower high-density lipoprotein (HDL) levels. The belief that testosterone is a risk factor for cardiac disease is based on the observation that men have both a higher incidence of cardiovascular events and higher testosterone levels than women do. There is little data for this idea. Many studies suggest the opposite. There are multiple studies showing a relation between hypogonadism and an increased cardiovascular risk. There is evidence that testosterone replacement therapy may be beneficial for men with cardiac disease. In a small study, men with chronic stable angina who were treated with transdermal testosterone replacement therapy had greater angina free exercise tolerance. Importantly, testosterone replacement therapy has not shown an increased incidence of cardiovascular disease or stroke. NV: There are some data on hypogonadism and increased risks of cardiovascular events. Is that what you mean? Some people actually become so severely hypogonadal, they actually may be risking higher incidence of heart attacks and strokes? MS: That is correct. There are numerous studies demonstrating the rela- tionship between low testosterone levels and adverse cardiovascular events, as well as stroke. Also, there are case study reports of people who stop anabolic steroids, and then suffer a heart attack. In the book that I wrote, one of the studies in the published literature, looking at the effects of anabolic steroids in certain populations, for 12 weeks, did not look at the patients after they stopped the drug. If you want to look at the effects of these drugs, you need to see what happens when you stop them. I filed a Freedom of Information Act to obtain the patient records. One of the patients actually suffered a heart attack within four weeks of stopping the anabolic steroid. The details, including the original patient records, of this case are reported in my book. NV: Should patients with an increased or elevated prostatic specific antigen (PSA) avoid testosterone? What role does testosterone replacement therapy (TRT) have on prostate cancer, if any? Is there a risk of worsening prostate cancer with TRT? MS: You brought up a number of important and controversial issues. It is generally agreed that TRT with established prostate cancer is contraindicated. It is known that suppression of testosterone levels causes regression of prostate cancer, and it is now commonplace for men with metastatic prostate cancer to undergo treatment designed to lower testosterone levels. The question becomes if lowering testosterone causes prostate cancer to regress, does elevating testosterone cause prostate cancer to appear? 200,000 men are given a diagnosis of prostate cancer each year, and most of these cases are first detected by a rise in the PSA level unrelated to testosterone therapy. Studies have demonstrated a low frequency of prostate cancer in association with TRT. Despite extensive research, there is no compelling evidence that testosterone has a causative role in prostate cancer. There appears to be no compelling evidence at present to suggest that men with higher testosterone levels are at greater risk of prostate cancer or treating men who have hypogonadism with exogenous androgens increases this risk. In fact, prostate cancer becomes more prevalent exactly at the time of a man’s life when testosterone levels decline. Little evidence exists on the safety of TRT initiation after treatment for primary prostate cancer. In one very small case series, TRT after treatment of organ confined prostate cancer produced no adverse effects. There are no large, long-term studies proving that the risk of recurrence is not affected by TRT. Personally, I would be reluctant to provide TRT in prostate cancer; treatment should be left to strict research protocols. PSA is a serum glycoprotein made by the normal prostate that is widely used as a tumor marker, because elevated PSA levels correlate with the risk of prostate cancer. A PSA value greater than 4.0 ng/mL has been the standard indication for prostate biopsy since the introduction of this test in the 1980s. Testosterone trials have inconsistently shown a rise in PSA, typically between 0.2 and 0.5 ng/mL. A greater increase in PSA arouses concern that prostate cancer has developed. It is my practice to recommend a prostate biopsy in any patient with a yearly PSA increase of 1.0 ng/mL or more. If the PSA level increases by 0.75 ng/mL in one year, I repeat the PSA measurement in three to six months and recommend a biopsy if there is any further increase. NV: Can you explain what polycythemia is and what it means when it comes to cardiovascular risk and other issues? MS: In respect to anabolic steroid-induced polycythemia, polycythemia is a condition that results in an increased level of circulating red blood cells in the blood stream. Erythrocytosis is a more specific term that is used to denote increased red blood cells. People with polycythemia have an increase in hematocrit, hemoglobin, or red blood cell count above the normal limits. The reporting of polycythemia is typically in terms of increased hematocrit or hemoglobin. Hematocrit is a blood test that measures the percentage of red blood cells found in the whole blood. This measurement depends on the number and size of red blood cells. Normally, for a male, the hematocrit raises up to a level of 52–54 depending on the reporting laboratory reference range. Polycythemia is considered when the hematocrit is greater than the upper limit of normal. Hemoglobin is the protein molecule in red blood cells that carries oxygen from the lungs to the body’s tissues and returns carbon dioxide from the tissues to the lungs. The hemoglobin level is expressed as the amount of hemoglobin in grams (g) per deciliter (dl) of the whole blood, a deciliter being 100 mL, for adult males: 14–18 gm/dL. Polycythemia is considered when a hemoglobin level is greater than 18 g/dL in men. It is a thickening of the blood. The blood becomes almost like sludge. You would think that with the increased number of red blood cells, it would carry more oxygen; but its oxygen-carrying capacity decreases markedly. Without treatment, polycythemia can be life threatening. Elevation above the normal range may have grave consequences, particularly in the elderly, since an attendant increase in blood viscosity could aggravate vascular disease in the coronary, cerebrovascular, or peripheral vascular circulation. However, with proper medical care, many people experience few problems related to this disease. Symptoms of polycythemia can be none to minimal in many people. Some general and nonspecific symptoms include weakness, fatigue, headache, itching, redness of your skin, bruising, joint pain, dizziness, abdominal pain, shortness of breath, breathing difficulty when you lie down; and numbness, tingling, or burning in the hands, feet, arms, or legs. NV: Or when they work out, they turn red. MS: That can certainly be a symptom of polycythemia. NV: Is the incidence of polycythemia related to the route of administration, dose, duration, and age? Is polycythemia common in replacement doses? MS: Yes. It occurs quite frequently in people who are just on replacement testosterone. Older men appear more sensitive to the erythropoietic effects of testosterone than young men do. Both testosterone dose and mode of delivery affect the magnitude of hematocrit elevation. The incidence of testosterone-associated polycythemia may be lower in males receiving pharmacokinetically steady-state delivery of testosterone formulations, than it is in receiving intramuscular injections. In patients using topical preparations, there is a 5–20 percent incidence of erythrocytosis. There is an apparent direct relation between testosterone dosage and the incidence of erythrocytosis. Erythrocytosis occurs in about 5– 15 percent by patches and in 10–20 percent with gel preparations depending on the use of 50 mg/day (delivering 5 mg /day) and 100 mg/day (delivering 10 mg/day) during the course of approximately 14 year. The most commonly used forms of intramuscular-injectable testosterone esters are testosterone enanthate and cypionate. Injectable testosterone esters generate supranormal testosterone levels shortly after injection and then testosterone levels decline very rapidly, becoming subnormal in the days before the next injection. Testosterone ester injections have been reported to be associated with a higher risk of erythrocytosis than transdermal testosterone. It is unclear whether the higher frequency of erythrocytosis observed with injectable testosterone esters is due to the higher dose of testosterone delivered by the injections or the higher peaks of testosterone levels. In one study, intramuscular injections of testosterone enanthate produced an elevated hematocrit over 40 percent. NV: Is therapeutic phlebotomy a good way to manage polycythemia? MS: Untoward events are unlikely with mild erythrocytosis of relatively short duration. Therapeutic phlebotomy and blood donation are overall a safe procedure, the frequency of side effects being low and their severity weak. Other options include dosage reduction or the withholding of testosterone. However, these latter options can be problematic since the patient will experience symptoms of anabolic steroid-induced hypogonadism. This does present a catch-22 for many physicians. Because the half-life of the red blood cell is approximately 120 days, it might be a considerable length of time, more than three months or longer, to normalize the hemoglobin or hematocrit upon TRT cessation. But, the problem of anabolic steroid-induced hypogonadism symptoms complicated matters. Many a times, an attempt will be to maintain TRT while simultaneously performing a therapeutic phlebotomy. Because of the increased erythropoiesis, production of red blood cells, it feels like the proverbial chasing one’s tail. In a number of therapeutic phlebotomies, the units of the blood that have to be taken off are clearly quite excessive; and we do not want to do that too quickly. It may come to be three, four, or even five pints of blood that have to be taken off. In order to get a good hold on the problem of polycythemia, it will be necessary to discontinue TRT. What we have done again, in our protocol, is that we have stopped the testosterone, thereby removing the cause of the increased red blood cell production, treat them with the HPTA protocol that prevents the hypogonadism, and have the therapeutic phlebotomy done. They are able to get the hemoglobin or hematocrit down to the normal level, do not go through the adverse effects of the hypogonadism; and then, at the other end, be able to start the testosterone therapy again. As far as we can determine, no testosterone associated thromboembolic events have been reported to date. NV: I am actually surprised how many patients are out there that do not have their physician following up their hematocrit when they are put on testosterone or anabolics for wasting syndrome. It is something that the physician should be looking out for and measuring. MS: The hemoglobin and hematocrit is part of the routine laboratory follow-up for anyone on TRT. If a patient complains of any of the symptoms we describe for polycythemia, a hemoglobin and hematocrit should be checked. One of the confounding problems is the symptoms tend to be nonspecific. NV: Can you say something about the prophylactic use of finasteride or dutasteride to avoid DHT-related problems like prostate enlargement or hair loss? Is there a role for the use of finasteride or dutasteride to prevent the possible increase of hair loss with TRT? MS: Finasteride and dutasteride are 5-alpha reductase inhibitors. 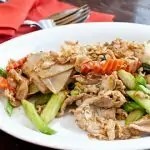 5-alpha reductase comes in two forms, type 1 and type 2, and is responsible for the conversion of testosterone into DHT. Finasteride inhibits type 2 only while dutasteride inhibits both forms. Finasteride comes in two doses depending on whether the indication is for hair loss or benign prostate hypertrophy. Propecia, 1 mg, is for hair loss. Proscar, 5 mg, is for prostatic hypertrophy. DHT has been shown to be important in the development of hair loss or male pattern baldness. I am unaware any studies indicating a worsening of hair loss or male pattern baldness, though this possibility has not been carefully studied. There are anecdotal reports. The prophylactic use of these drugs is an individual decision after weighing the risks and benefits. DHT is also important in prostate health. It is thought an overabundance of DHT may be important in benign prostatic hyperplasia (BPH) and prostate cancer. Dutasteride provides greater suppression of DHT than finasteride does, thereby underlying the hypothesis that inhibition of both type 1 and type 2 would provide correspondingly greater protection than inhibition of type 2 alone. However, significant side effects of finasteride use include reduced volume of ejaculate, erectile dysfunction, loss of libido, and gynecomastia. This will prevent many from their use. Some people think that DHT will affect lean body composition. DHT does have a higher affinity for the androgen receptor. But the enzyme that converts testosterone into DHT is not located in the muscle. There is no evidence for these drugs to effect muscle mass. NV: What about other issues related TRT, such as to increased estro-gen levels and gynecomastia? MS: A small number report breast tenderness and swelling. Fluid retention is uncommon and generally mild, but TRT should be used cautiously in men with congestive heart failure or renal insufficiency. After confirmation of elevated estrogen, estradiol, levels, this can be treated with either an aromatization inhibitor or estradiol receptor blocker. This must be done very carefully as any prolonged reduction in estradiol levels runs the risk of causing osteoporosis. Exacerbation of sleep apnea or the development of sleep apnea has been associated with TRT who have other identifiable risk factors for sleep apnea. The mechanism appears to be central mediated rather than by means of changes in the airway. Other side effects include acne, oily skin, increased body hair, and flushing. Hypertension has rarely been reported. Of course, the adverse effect I am most concerned with is androgen- induced hypogonadism, which occurs in one hundred percent of individuals stopping TRT, the variables being the duration and severity. 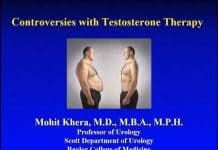 On testosterone replacement therapy, for those without organic hypogonadism, those with late onset of hypogonadism, the only thing that I always caution about is that people should not be on testosterone replacement therapy, year after year after year, without stopping every 12–18 months to restore the axis, to make sure the function is still there. The longer you are on testosterone, the harder it is going to be to come off testosterone. NV: In your opinion, can you tell us a little bit about the different options for TRT? Have you seen any difference in using gels versus injections? Is there any advantage or disadvantage to using either one? MS: Injectable, transdermal, buccal, and oral testosterone formulations are available for clinical use. These forms of treatment differ in several key areas. Oral preparations include methyl testosterone and fluoxymesterone, which are rarely prescribed because of their association with substantial liver toxicity. In Europe, there is an oral preparation of testosterone undecanoate, Andriol. It has a poor history of bioavailability. Recently, the FDA approved a buccal preparation of testosterone, Striant. Striant requires administration twice a day. It is used little at this time. Transdermal testosterone is available as a patch, Testim, and gel, Androgel. Daily application is required for each of these. They are designed to deliver 5–10 mg of testosterone a day. The advantages include ease of use and maintenance of relatively uniform serum testosterone levels over time. Skin irritation in the form of itching and redness is a frequent adverse effect of Testim with reports as high as 60–70 percent. This is uncommon with Androgel. Inadequate absorption through the skin may limit the value of transdermal preparations in some persons. A common problem is the low dose preparations provide inadequate serum testosterone levels. This is also seen with the high dose. The topical have become, by far, the most-used products in the last decade or so, approaching a billion dollars in sales. Androgel is the biggest product of the topical. If the patient is not too scared of doing injectables, oil-based testosterone ester preparations are available. The most commonly used injectables are Delatestryl or testosterone enanthate and depo testosterone or testosterone cypionate. In my practice, the typical dose is between 100 and 150 mg/week. The peak serum levels occur in 2–5 days after injection, and a return to baseline is usually observed 10 days after injection. In this manner, adequate serum levels are maintained. Intramuscular injections of testosterone can cause local pain, soreness, bruising, redness, swelling, and possible infection. NV: Most doctors prescribe 1-cc of 200 mL of testosterone every two weeks. Can you describe the problems with this schedule, if any? MS: This is a problem that is seen much more often than necessary. Many doctors use a typical dose is 100 mg/week or 200–300 mg every two to three weeks. Within 7–10 days after injection, the serum testosterone levels are low to abnormally low. This is described as a “roller coaster” effect, characterized by alternating periods of symptomatic benefit and a return to baseline symptoms, corresponding to the fluctuations in serum testosterone levels. This can be discovered by having the testosterone level checked within 24 hours prior to injection. NV: Can you talk to us a little bit about compounding pharmacy products? In particular, when using testosterone gels with concentrations higher than 1 percent for reaching total testosterone blood levels above 500 ng/L. Have you had any experience with the compounding industry? MS: I have had some experience with the compounding industry. Compounding pharmacies are very capable at providing higher concentrations of transdermal testosterone preparations. Because of this, they are able to supply a transdermal product in small volumes. They also tend to be less expensive than commercially available pharmaceutical testosterone replacement options. 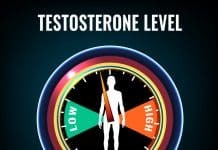 NV: Do you think it is advisable to get your testosterone levels rechecked after a few weeks of starting any of the therapies? MS: My protocol is that once I start a patient on testosterone, I check the testosterone level 4–6 weeks after initiating TRT. In patients using topical preparations, I recommend testing within 4–6 hours after application. Those using injectables of testosterone esters, I recommend testing within 24 hours before their next scheduled injection. 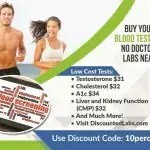 NV: Do you have any preference between the free testosterone and total testosterone test? 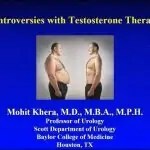 MS: In the monitoring of the patient on TRT, I utilize the total testosterone. The initial evaluation of a patient might include the use of free testosterone or bioavailable testosterone. In a symptomatic individual, the total testosterone can be normal but the free or bioavailable testosterone abnormal. Testosterone circulates in three forms. Testosterone circulates in a free or unbound state, tightly bound to SHBG, or weakly bound to the blood protein albumin. Bioavailable, non-SHBG, testosterone includes free testosterone and testosterone that is bound to albumin but does not include SHBG -bound testosterone. Examined changes over time have demonstrated a decrease in the total testosterone and an increase in SHBG levels. Because of this, the total testosterone might be normal, whereas the free or bioavailable testosterone is abnormal. If these alternative methods are used to diagnose hypogonadism, their utility during TRT is limited. I would caution about the assay methodology used to calculate the free or bioavailable testosterone. The methods used to conduct the measurements vary in their accuracy, standardization, the extent of validation, and the reproducibility of results. Bioavailable testosterone is measured or calculated in several ways. SHBG bound testosterone can be precipitated with ammonium sulfate and the remaining testosterone is then taken as the bioavailable. Measures of free testosterone (FT) are controversial. The only standardized and validated method is equilibrium dialysis or by calculating free testosterone levels based on separate measurements of testosterone and SHBG. Other measures of free testosterone are less accurate. NV: And your goal is usually to have patients above what level? MS: I like their total testosterone trough or lower level to be in the 500–700 range, normal being 300–1,000 ng/dL. NV: Besides checking of the initial T level, can you elaborate on the monitoring during TRT? MS: I recommend a periodic follow-up of patients receiving replacement testosterone therapy at the interval of three months during the first year of treatment. Afterward, patients are followed up every six months. It is important to do a review of systems to ensure the relief of the complaining symptoms as well as no worsening or new symptoms. In addition to the serum total testosterone, I routinely monitor the basic chemistry profile, which includes liver function, kidney function, electrolytes, glucose, lipid panel, and hemoglobin or hematocrit. At three months, I will often include estradiol and DHT levels. If the patient is older than 50 years, I include the PSA. The role of digital rectal examination (DRE) and PSA in detecting early, clinically significant, prostate cancer is controversial. I discuss this with each patient and allow them to decide on their use. Next articleIs Metformin a Miracle Anti-Aging Drug?